The Osmond Brothers are a singing group consisting initially of brothers, Alan, Wayne, Merrill, and Jay Osmond. They were later joined by brothers Donny and Jimmy. They are part of the Osmond Family. Their father, George, who loved to sing, taught his sons the tight harmonies of a barbershop quartet. They began singing in and around their native Ogden, Utah. Their father took them to California to audition for Lawrence Welk, but Welk was unable to meet with them. Disneyland hired them to perform at the park and consequently, Walt Disney took a personal interest in them and featured them in a Disney television special. 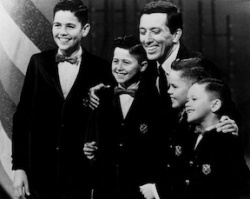 When the father of singer Andy Williams noticed them on the special, he called his son and told him to book the Osmond Brothers on his variety show, which he did. The Osmond Brothers appeared regularly on The Andy Williams Show from 1962 to 1969. Donny became part of the group in 1963. Oldest brothers Virl and Tom are deaf and were never part of the singing group. In the made-for-TV movie Inside the Osmonds, the brothers explain that they originally began performing to help pay for the special needs of their two older brothers. Their earnings also were to fund missions for all the brothers; they are members of The Church of Jesus Christ of Latter-day Saints. The Osmond Brothers also appeared regularly on the Jerry Lewis Show in 1969, but were anxious to transition into performing rock and roll. 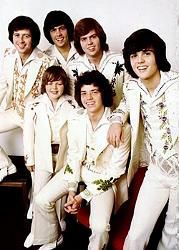 They shortened their name to The Osmonds, and with the help of Mike Curb, landed a record contract with MGM. Their first album, Osmonds, released in 1970. More albums followed, including Homemade (1971); Phase III, The Osmonds Live, and Crazy Horses (1972); The Plan (1973); and Love Me for a Reason (1974). Their last albums with MGM came in 1975, The Proud One and Around the World: Live in Concert. The first six albums were gold; the last three were silver. They have recorded several other albums with other record labels and toured extensively. The group's first single to hit the #1 spot was "One Bad Apple," written by George Jackson. At first, Merrill was the lead singer for the group but Donny eventually became a co-lead singer and they continued to record and perform hits such as "Go Away Little Girl," "Puppy Love," "Yo-Yo," and "Sweet and Innocent." They also began writing their own songs and playing their own instruments. As their popularity waned, and the older brothers wanted to tour less, they eventually disbanded in 1980. Donny and Jimmy went on to have successful solo careers. Alan Osmond was born on 22 June 1949. He made his national singing debut on The Andy Williams Show with three of his younger brothers. He played piano and guitar, co-wrote many songs, co-produced most of the group’s recordings, choreographed their dance movements, and sang backup. He appeared in the role of Micah Kissel on The Travels of Jaimie McPheeters, which starred Kurt Russell. Alan joined the California National Guard in the late 1960s and served at Fort Ord. He was diagnosed with multiple sclerosis and has since retired from performing. He appeared, however, in the 50th anniversary series of appearances and performances. He received the Dorothy Corwin Spirit of Life Award from the National Multiple Sclerosis Society in 2000. He is a motivational speaker and runs the OneHeart Foundation. His son David also has MS. Alan and his wife, Suzanne, are the parents of eight sons - Michael, Nathan, Douglas, David, Scott, Jon, Alex, and Tyler. Wayne Osmond was born on 28 August 1951. He began performing at the age of six and made his national television debut on The Andy Williams Show with brothers Alan, Merrill, and Jay. In the group, he was a guitarist and singer, but he also plays the flute, clarinet, saxophone, violin, banjo, piano, drums, and bagpipe. He and brothers Merrill and Alan wrote many of the Osmond songs in the 1970s. He also appeared on the television series The Travels of Jaimie McPheeters with his brothers Alan, Merrill, and Wayne. He played the role of Leviticus Kissell. Wayne moved to Branson, Missouri, in the 1990s where he performed with his brothers at the Osmond Family Theater, Country Tonight, Moon River Theater, and the Branson Variety Theater. He was diagnosed and successfully treated for a brain tumor in 1997. He has since retired from performing, but joined his family for a 50th anniversary series of performances and appearances. He and his wife, Kathlyn, have five children. Merrill Osmond was born on 30 April 1953. He performed with his brothers on The Andy Williams Show from 1962 to 1969. As a pop music group, Merrill was the lead singer and co-wrote many of the songs with brothers Alan and Wayne. He also plays the bass guitar. He received two "People’s Choice" awards, two "Grammy" nominations, and five #1 Billboard Hits. He and his brothers appeared in nine episodes of the ABC Western television series, The Travels of Jaimie McPheeters, which starred Kurt Russell. Merrill appeared in the role of Deuteronomy Kissel. He shifted to country music with his brothers. He produced "The Making of an Inauguration" for President Ronald Reagan and "The Quincentennial Inaugural Ball" for President George Bush. He has produced a series of CDs that help with relaxation and stress management. He and his wife, Mary, are the parents of six children. Jay Osmond was born on 2 March 1955. He started singing with his brothers at the age of two and a half and made his national debut on The Andy Williams Show. He was backup singer and drummer with the Osmond Brothers. He also co-wrote many of their songs. Jay appeared as Lamentations Kissel in the short-run of The Travels of Jaimie McPheeters, a television series that starred Kurt Russell. He co-produced The Donny & Marie Show and choreographed many of their dance numbers. He earned a degree from Brigham Young University and then joined his brothers at The Osmond Family Theater in Branson, Missouri. In 1994, he released a solo recording It’s About Time. His second solo album, It’s About Time Again, released in 2009. He also wrote an autobiography, Stages—An Autobiography (2010). He and his first wife, Kandilyn, are the parents of three sons; they divorced in 2011. He married Karen Randall in 2014. This page was last edited on 27 March 2019, at 11:02.